Best New Business Venture WINNERS!!! 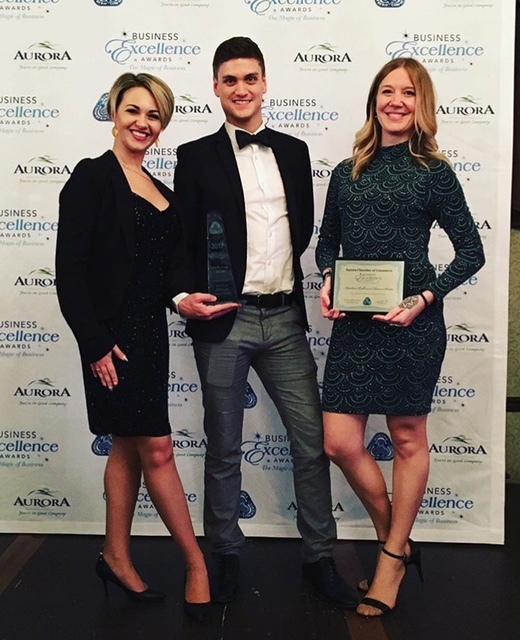 On Thursday, November 16th Patrick, Anastasia & Kelly attended the Aurora Business Excellence Awards (BEA) presented by the Aurora Chamber of Commerce at King’s Riding Golf Club. It was a huge honour to even be nominated! But we are thrilled to say we won the award for Best New Business Venture! Thank you to the Aurora Chamber of Commerce and the BEA committee for hosting such an amazing gala evening with great support from the town and business community. We even got treated to some magic tricks while we were there. Here’s a link to the Auroran newspaper article. Most of all we want to thank our ARTISTICA FAMILY for always supporting us and cheering us on. All of you are such awesome people and we are grateful for everyday that we get to dance and be in your company! https://i0.wp.com/artisticaballroomdance.com/wp-content/uploads/2017/11/AuroraChamber-1.png?fit=214%2C202 202 214 The Artistica Team http://artisticaballroomdance.com/wp-content/uploads/2018/09/09-2018-ArtisticaV2TMD.png The Artistica Team2017-11-17 21:04:432017-11-27 22:33:30Best New Business Venture WINNERS!! !